Another day, another hit piece against law suits about website accessibility. This time lawsuits against restaurants. Typically these articles are best ignored. But a recent piece in the New York Post demands attention. I’ve asked web accessibility leader and home cook extraordinaire Lucy Greco to join me in responding to the article, Lawyers cash in on suits demanding ADA-compliant websites. You’ll find out below why Lucy’s cooking skills are as relevant to this piece as her web expertise. I wonder what Christine Ha, the 2012 winner of TV’s Master Chef would say about this quote. After all, Chef Ha is blind. Lucy Greco also knows better. Greco, whose day job is as the Web Accessibility Evangelist for the University of California Berkeley, is an accomplished home cook. Not only is she an excellent scratch baker and cook, but she grinds her own wheat and roasts her own coffee beans. She teaches cooking classes and along with her husband Mike Duigou Lucy also brews her own beer. Greco’s holiday dinners offer a welcoming table for family and friends, with days of cooking leading up to a delicious meal. Cooking has always been very important to me as it’s one of the few things I can excel at no matter what my disability. Before I first picked up the computer and discovered that I had a passion for the web and making it better for everyone, I wanted to cook. And I didn’t just want to cook. I wanted to cook good food that others would enjoy. The statements in the New York Post came as a direct insult to me personally. I’ve never considered my vision to be a problem in my cooking. When people use visual words to describe food I just consider these names for terms and not actual visual references. If you talk about browning meat, for example, I don’t think of brown as the color, but as a process that is adding flavor and texture to our food. When my mother first taught me to cook she was so worried that she was not doing it properly she asked many other people to help teach me. What I learned from my mother though was the stuff that stuck with me for the rest of my life. Home economics teachers focused so much on measuring and weighing and portioning that they never had the heart of food that my mother did. 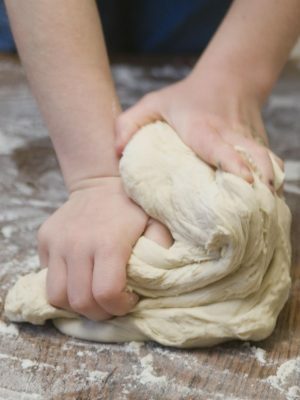 When my mother taught me to bake bread she told me to “keep kneading it until it feels right.” There’s no visual way to tell that your bread is done properly. It’s all in the hands and if you can’t feel the bread coming together properly it’s not done yet. No sight required. Lucy told me that the chef at her favorite French restaurant taught her the secret to making the “juiciest flavorful steak you will ever have.” The recipe didn’t call for vision and the chef didn’t question Lucy’s ability to make the meal. Lucy Greco’s message to anyone reading the Post article? Ignore what is said about blind people and cooking. And check your stereotypes, don’t make assumptions. Thinking that blind people can’t cook contributes to the shockingly high rate of unemployment experienced by people with visual impairments in the United States and globally. Just because blind people can cook at home does not mean they don’t need online access to restaurant websites. They do. Any restaurant that doesn’t have an accessibility plan is making a mistake. After the Winn-Dixie grocery chain lost the country’s first ADA trial about digital access, I wrote a post decrying the store’s failure to pay attention to web access legal developments in the grocery industry. Read: Web Accessibility for Grocers: Winn-Dixie Wasn’t Paying Attention. Now I say the same thing to the restaurants being sued for not having accessible websites: You should have paid attention. Denny’s announced its digital accessibility initiative in January, 2016. Read the Denny’s accessibility press release. The announcement was a result of Structured Negotiation with a blind customer and the American Council of the Blind. You can read the full Denny’s Digital Accessibility agreement here. It addresses accessibility of the company’s website, mobile app, and emails sent to customers. And like responsible companies everywhere, Denny’s has an accessibility Information page, linked to its homepage footer. Visit Denny’s Accessibility Information Page. A year after Denny’s announcement came the news that Sweetgreen restaurant chain had settled a class action web accessibility lawsuit. The lawsuit had received press attention in the Washington Post. And the full accessibility settlement agreement, negotiated by lawyers at the Washington Lawyers Committee for Civil Rights is public. Restaurants are on notice: as public accommodations you are covered by the Americans with Disabilities Act. Your websites and mobile apps must be accessible. Really?? This line was not only incorrect, but depressing. The international accessibility community is thriving and vibrant. The largest companies in the world have made commitments to an inclusive digital presence, and back up that commitment with dollars, policies, teams and leadership. Microsoft, Apple, Google, are but a few of these companies. Many in the private sector, as well as universities and government agencies prominently post their accessibility information pages — just like Denny’s does. check out accessibility information pages . If your lawyer, web designer or web developer doesn’t know accessibility the solution is simple: hire someone else. It goes without saying that blind cooks — like sighted ones — go online. Everyone wants to read restaurant reviews, menus and nutritional information. All cooks want the best prices and most nutritional food for their families, information readily available online. The late Becky Griffith was one such blind cook. When the New York Post quoted a lawyer as saying that blind people eat prepared food, Becky jumped immediately to mind. She was one of the claimants in our Structured Negotiation with Safeway about the accessibility of its online shopping site. One of those [Safeway] shoppers was Becky Griffith, an accomplished home cook who had been blind since her late twenties. While sighted people may be surprised to hear that blind people cook, Griffith, who died shortly after the negotiation ended, knew vision is not a required kitchen skill. And while she preferred to go to the supermarket, Griffith still needed to rely on the Safeway website to study nutritional information, serving sizes, and cost before printing out a shopping list to show store staff. Like Lucy Greco, Becky Griffith was a blind cook and a frequent computer user visiting restaurants and grocery stores both online and in person. Accessibility makes the online part possible for these blind cooks and tens of thousands of others. In Lucy Greco’s work as a web accessibility professional, she hears remarks that echo mistaken notions about blind people not cooking. Her experience as an accomplished cook helps her respond. Developers will ask Greco “why do blind people need to know about an image when it’s visual and they can’t see it?” or wonder “A deaf person can’t hear the tone of voice, so why do they need to know the tone changed? In both cases Lucy encourages the developer to tell her what the image or the tone of voice is trying to convey. What is the message? It’s not hard, and it’s not new. It’s about civil rights and inclusion. Let’s stop making excuses and build a web that’s usable by everyone. This is a post about cooking and web accessibility. An article in a New York paper said that blind people have difficulty cooking. Lucy Greco is a web access expert and a home cook. She even bakes her own bread and grinds her own wheat. Lucy is blind, and explains that cooking is not about vision. Blind people, including blind cooks, eat in restaurants like everyone else. Restaurant websites need to be designed so everyone can use them. Restaurants should know this by now. There have been Structured Negotiation and lawsuits to make restaurant websites accessible. Back to top of this post.